Nearly three years ago, back when President Trump was a candidate, voters were clear on his illegal immigration stance. Then-candidate Trump promised a “big beautiful” wall, a vow that helped him blow 17 other contenders out of the water. But among the cognoscenti, those knee-deep in immigration issues 24/7, serious doubt existed about candidate-Trump’s depth of legal immigration knowledge. Since only a tiny percentage of American voters clearly understand the complexity of federal immigration laws, no real reason existed to expect that business mogul Trump would be among them. One of President Trump’s most recent tweets about the H-1B visa proves two things: one, that the skeptics are right. President Trump is badly under-informed about legal immigration. And two, assuming he’s serious about his often-made promised to clean up the temporary guest worker visa mess that been so harmful to and displaced so many American workers, he’s talking to the wrong people, most likely pro-H-1B visa special interest lobbyists and immigration lawyers. Absent from high level H-1B conversation are those most directly affected – U.S. tech workers. Under current immigration law, H-1B holders have the option to apply for a green card to obtain permanent residency before their work visas expire; typically a three-year term with quasi-automatic three-year extensions. Then, applicants have a minimum five-year wait period before they can apply for citizenship. In other words, H-1Bs are already on a path to citizenship, if they chose to pursue it. John Miano, co-author of “Sold Out” which details how greedy employers and a craven Beltway crowd have subverted U.S. tech workers, pointed out that the citizenship fringe benefit plum has helped employers recruit foreign-born workers. The H-1B visa means that, for the holders, returning home is optional. 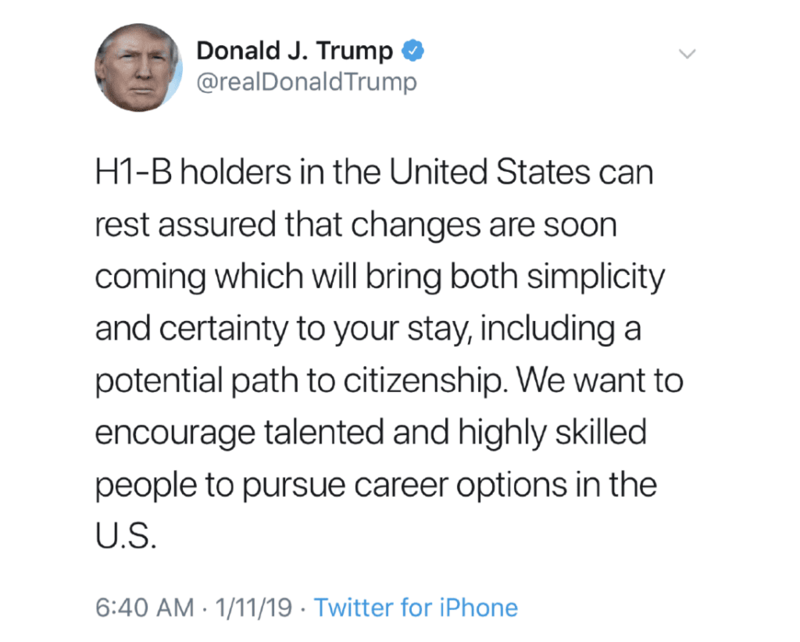 The second part of President Trump’s tweet indicated that he’s been poorly advised and heavily influenced, quite likely by members of his pro-H-1B holdover staff. Part two: “We want to encourage talented and highly skilled people to pursue career options in the U.S.” Wrong! President Trump is quoting vapid, age-old talking points – proven false – that major corporations and their lobbyists who benefit from cheap labor endlessly promote. Despite purposely deceptive messaging about the imagined need for more H-1B visas and the holders’ exceptional skills, numerous left-leaning think tanks, including the Economic Policy Institute, have debunked that argument. Ron Hira, a Howard University associate professor of public policy and “Outsourcing America” author, wrote in an EPI post that the H-1B’s original intent was to bring in foreign workers who complement the U.S. workforce. Instead, Hira concluded, loopholes have made it too easy to bring in cheaper foreign workers, with ordinary skills, “who directly substitute for, rather than complement, workers already in the country. They are clearly displacing and denying opportunities to U.S. workers.” The U.S. Tech Workers website emphasizes that today in Silicon Valley American citizens account for only 29 percent of the workforce. President Trump’s error-ridden tweet insults U.S. tech workers, as well as other Americans, that a cockamamy employment-based visa system creates, and reminds voters that the President has abandoned his supporters, those who elected him. The U.S. President’s first obligation is to the nations’ citizens, not foreign national job seekers. 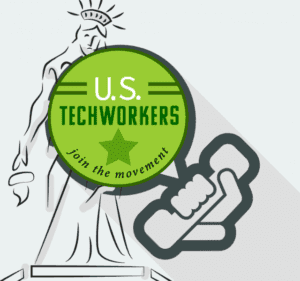 American tech workers must be protected, not victimized. Joe Guzzardi is a Progressives for Immigration Reform analyst who has written about immigration for more than 30 years. Contact him at jguzzardi @ pfirdc dot org. 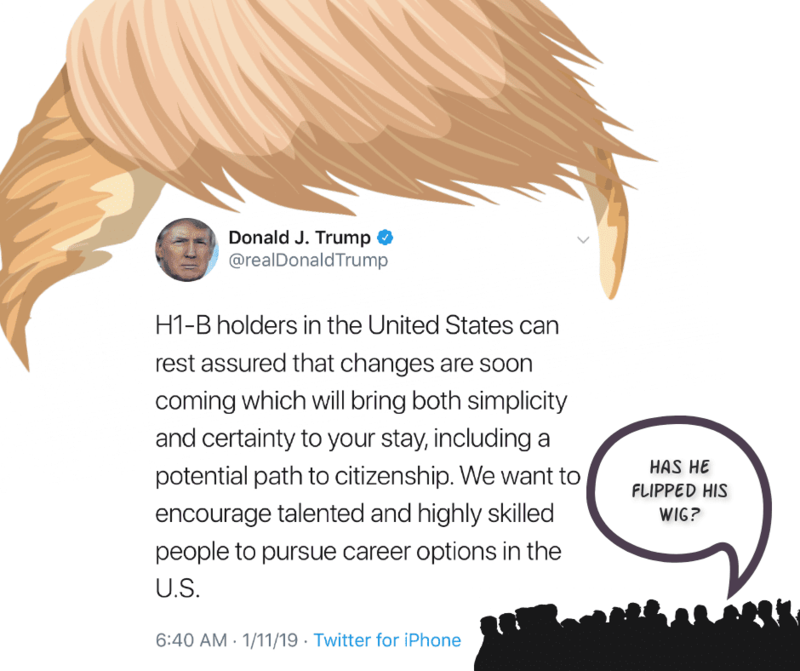 This entry was posted in H1-B News, Updates and tagged American job displacement, h1-b, outsourcing, Trump tweets, U.S. tech workers.